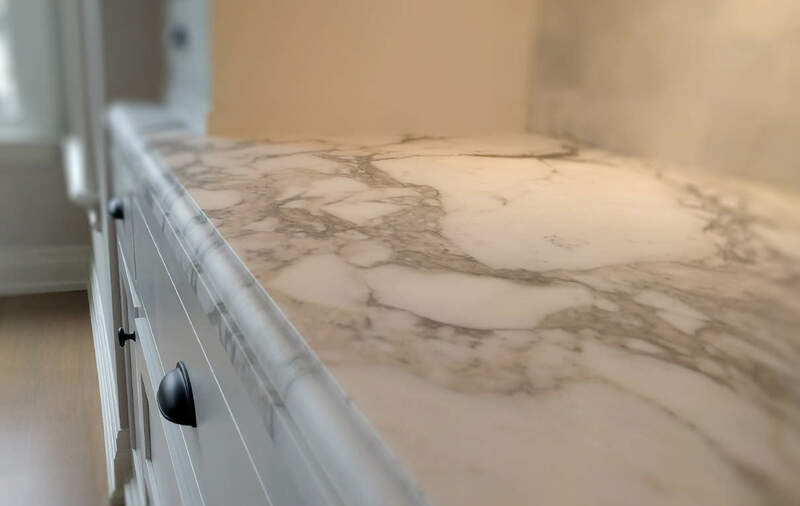 Residential Marble Care • Intex Surface Solutions ltd.
Our goal is to make your restoration project a comfortable, pleasant experience. Beyond providing excellent quality services, our mandate is to be as flexible to your needs as possible; this includes making you aware of all steps, safety precautions, budget options and long term maintenance expectations before we even start working. We aim to provide completely accurate estimates, with no hidden fees or surprises. As always, our estimates are free. Safety is our primary concern, and our experiences from the new development sector are fully applied while working in your home. We are fully insured, and all workers are equipped with WSIB, WHMIS and fall protection. Furthermore, we carry MSDS (material safety data sheets) for all our products at all times. We make you aware of any odours or toxic products used before we start, and will notify you before we commence sealing or working with epoxies or other solvent based products. We are happy to inform you we use a premium food safe penetrating sealer, formulated for use in the food preparation industry. We aim to be as transparent as possible, leaving your home the way we found it. All areas susceptible to damage will be protected by plastic and a variety of water proof adhesives that are gentle to existing stain and paint. We also use foam padding under our water proof drop cloths. Because we use water for all sanding/grinding/re-surfacing processes, there is no creation of dust inside your home during the restoration process, and all water and excess/waste material is collected and safely disposed of. Our job has put us in the unique position to service and re-service the same homes over the years. Being exposed to such a variety of materials allows us to provide long term maintenance advice to our new and returning clients. This experience gives us the ability to recommend finishes that suit your lifestyle and compliment long term maintenance expectations. We often suggest lower maintenance solutions for areas of your home that see the most traffic, allowing you to spend less in the long run. This ideology applies to both inside and outside your home, which is why we only use re-coatable sealers and deck stains, preventing costly overhauls of your natural stone or wood. It is a pleasure for us to share our knowledge regarding the materials around your home, and how to maintain them. At the end of every job you will be provided with a copy of our care guide, a list of safe to use cleaners and suggested tools such as micro fiber mops and squeegees. We can also educate your house-keeping staff on how to properly maintain your natural stone. If you are looking to renovate your home, don't hesitate to ask us which material is best suited for the various areas in your home, or to connect you with our network of trusted contractors and designers.